Proud captain Dougie Gair insists new Lowland League champions Edinburgh City will fancy their chances of winning promotion to League Two through the end-of-season play-offs. The Meadowbank outfit were officially crowned champions on Friday night after Whitehill Welfare, the only team who could still catch them, lost to East Kilbride. A first league defeat of the campaign away at Dalbeattie yesterday wasn’t enough to dampen City’s delight at giving themselves a chance of making it into Scotland’s fourth tier. 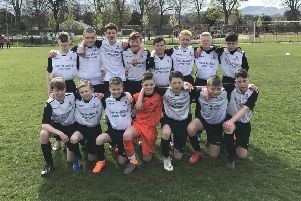 “It has been a phenomenal season and a great achievement for the lads who deserve it because we have all worked our socks off since our first pre-season training session,” said Gair. “This is the best group of boys I have been involved with for dedication and the will to win. “I’m very proud of everyone involved with the club. We have learned each other’s games inside out and we all know what is happening. We have built friendships and we are all mates in the dressing-room. Yesterday’s game kicked-off at the unusually early time of noon as part of GroundhopUK, which saw football supporters from as far south as London and Cardiff take in six Lowland League matches in three days. City were shocked after only 90 seconds when Jack Steele shrugged aside two challenges to fire a low shot from 14 yards past Andrew Stobie. City rallied and after decent efforts from Jordan Caddow, Ross Guthrie, John Dunn, Mark Osborne and Ross Allum, they equalised on the stroke of half-time when a long diagonal ball from Shaun Harrison picked out Osborne wide on the left and his low cross was well converted by Gair from 16 yards. City dominated the second half, with Allum testing their goalkeeper on numerous occasions while Gair had a shot kicked off the line. However, in a breakaway with 15 minutes left, Liam Park tangled with Frazer Paterson in the box and a penalty was awarded, which Sloan duly converted. City bombarded Dalbeattie for the remainder of the game and Ortega Deniran had an effort ruled out for offside, but there was to be no equaliser. Reflecting on his side’s title success, he said: “It is unbelievable. We have been working towards it for a long time, four or five years, and the majority of this group have grown from boys into men. Ross Allum has come in and in the first half of the season he was terrific while Joe Mbu has been a true leader. “Dougie Gair is a fantastic captain for the club but Joe was the leader we needed. John Dunn has been head and shoulders above everybody in the entire league this season. Mark Osborne has been on fire and, apart from Joe, their best years are still ahead of them. The future is bright and we are looking to build on the success we have had so far this season. Dalbeattie Star: Martin, Maxwell, Neill, Anderson (Muir 60), Cameron, Fergusson, Wells, Todd (Cook 60), Steele, Sloan, Park. Subs: Baxter, Kerr, Drysdale. Edinburgh City: Scobie, Caddow (Deniran 78), Osborne (MacDonald 78), Harrison, Paterson, McKee, McFarland, Gair, Allum, Dunn, Guthrie (McConnell 68). Subs: Donaldson, Torrance, Vanson.